I don’t own a single pair of fancy pants. My pants are plain. I don’t really pay much attention to garnishes, I don’t know how to foam or make tiny balls out of food and I don’t really deconstruct things. So I had no idea what to do about this post until this morning when I fancied a s’more. 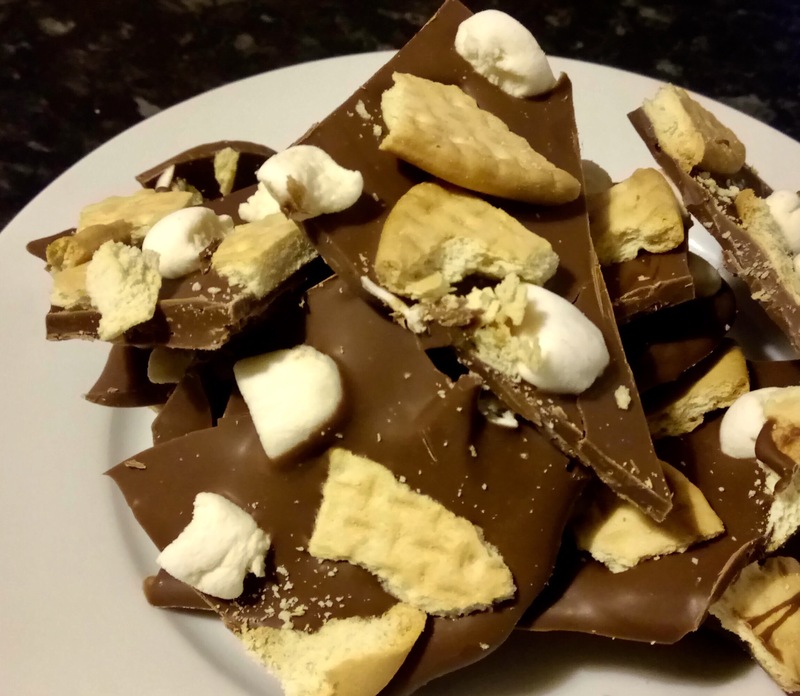 I took the component parts; biscuit, marshmallow, chocolate, and put it back together into a chocolate bark. Well almost. I couldn’t find any vegan digestives within walking distance so I substituted with rich tea. Not quite the same but works in a pinch. 1. Line a tray with baking parchment. 3. Spread the melted chocolate onto the baking parchment. 4. Sprinkle on the marshmallows and biscuits. 5. Pat the toppings down a little and leave the chocolate to solidify. I sometimes see these recipes shared on Facebook that have Just Three Ingredients and I think would a couple more ingredients really make it that much more complicated? I think of Indian curries with lists of spices but it’s not that much harder to make a plain tomato sauce. I don’t believe in forcing simplicity but some things are naturally simple and this pasta dish is one. Just to prove that I could I bought all the ingredients at Tesco metro. So on a busy night I could pop out, buy the ingredients and cook the dish in about an hour. Obviously your mileage from a Tesco metro may vary. 1. 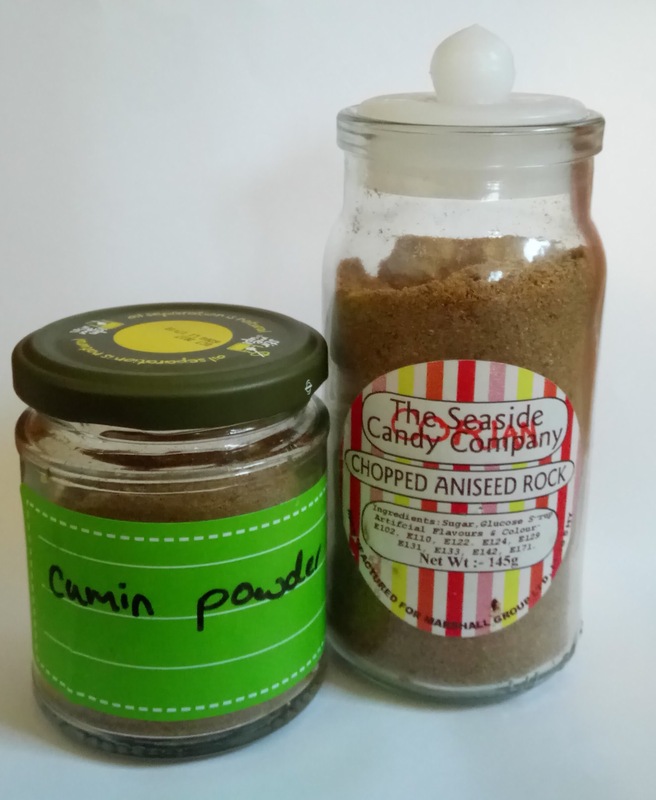 Pop the bread into a blender or food processor and chop it down into rough breadcrumbs. 2. 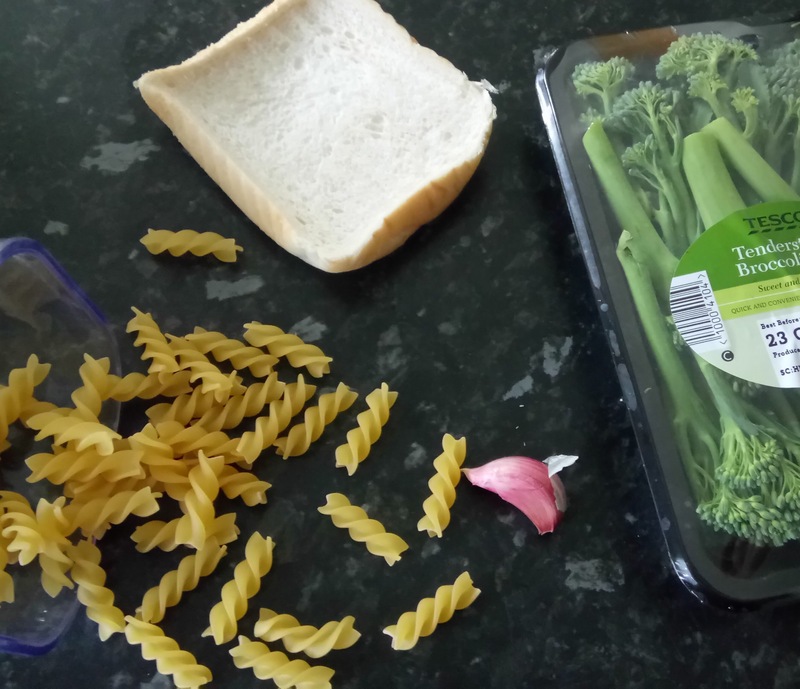 Cook the pasta according to the package directions, when it has three minutes to go toss in the broccoli to cook. 3. Meanwhile heat the oil in a large frying pan and when it’s hot fry the garlic for 30 seconds. 4. Add the breadcrumbs to the pan, tossing them to toast eavenly. 5. 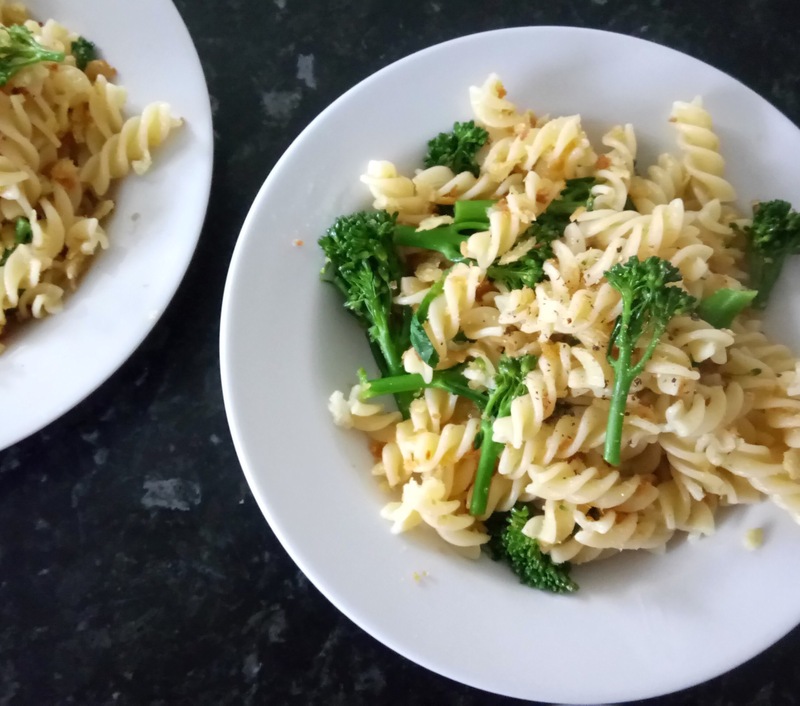 When the pasta and broccoli is finished drain it off and toss with the garlic breadcrumbs. I have a large and varied spice collection but there are two that stand out for me. I like to think of them as siblings, or best mates. They appear together around the globe: from India, across the Middle East, to the Americas. It’s coriander and cumin. Just like I love all sorts of spices I love all sorts of food cooked with them. I’ve already paired these together chilli this mofo. It’s time to use it on potatoes. The following recipy serves 2. 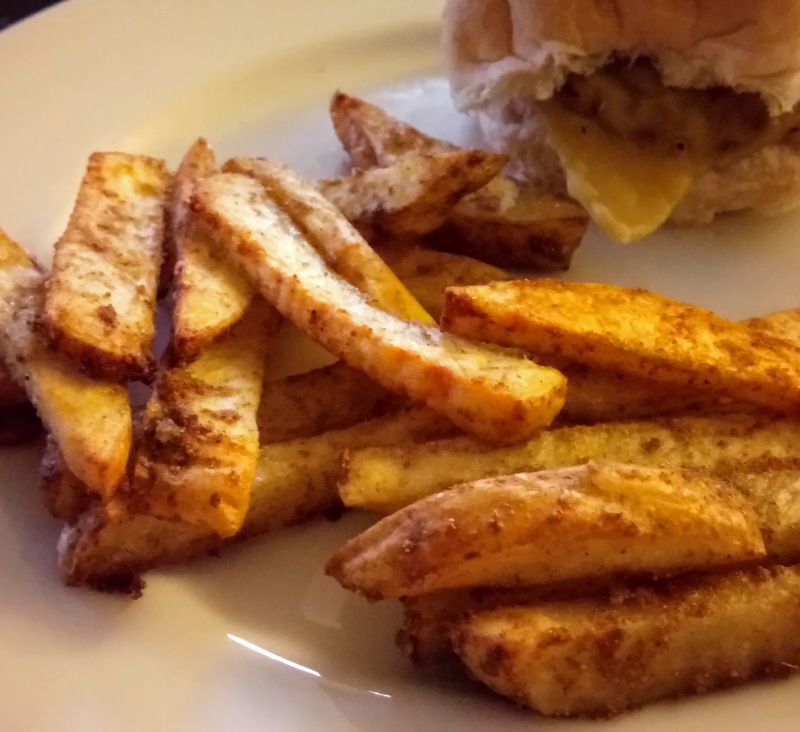 Slice the chips, try not to leave many thicker than 1.5cm. As for skins you can leave them on or off, your choice. Place the spices in a large bowl, place the chips on top and drizzle the oil on. Shake everything around until fully coated. Bake in the oven for 45 mins. Flip the chips over half way through. Chilli, you may be thinking, isn’t that impressive as a meal. It’s pretty standard. So why do I think it makes a great conversion meal? Well most people care about animal suffering and they’ll admit that vegan food tastes good but a lot of people think being vegan is impossibly hard. Chilli is not impossibly hard. It’s easy. It’s tasty. You can save extras for leftovers, scale up for a large group, cook it on an open flame, cook it in your kitchen, serve it with rice or spuds, or spaghetti. It’s also ridiculously easy to convert your existing recipe to be animal free. You can use one of the meany veggie mince substitute on the market, fill it with veggies, or do what I do and bean it up. 1. Heat the oil in a pan over a medium high heat and add the onion, cook until translucent. 3. Throw in the tomatoes, then fill your tomato can half full with water (or half empty) and pop that in the pan too. Add the can of black beans and simmer for twenty minutes. 4. Salt to taste and serve. And that’s how easy it is to be vegan.